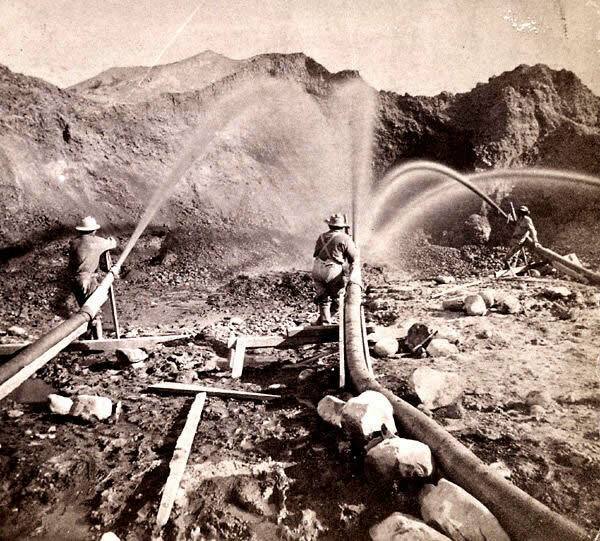 The first use of this method is credited to Edward Mattison in 1853 who supplied the water through a rawhide hose to a nozzle he carved out of wood. 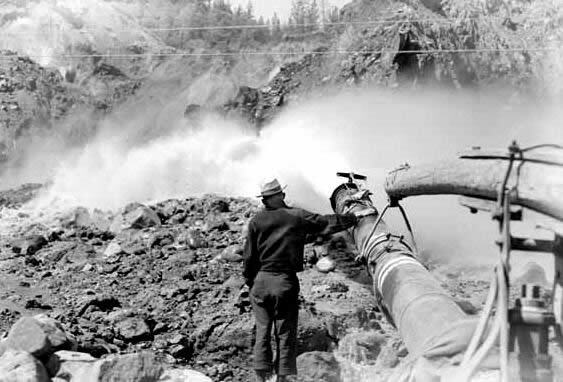 Later miners upgraded their hoses to metal or the more desirable canvas, and the nozzle soon became iron. 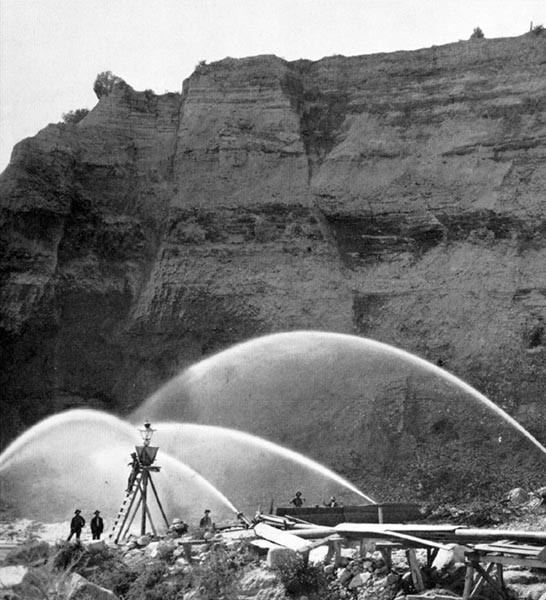 Technological advances made the hose and nozzle connections more flexible and allowed greater movement. Lavish attention was paid to the design and specifications of the nozzle and companies began producing their competing appliances. The product names were various — Hoskin’s Dictator and Hoskin’s Little Giant are examples. But the name that stuck was the product name of the Craig Company — the Monitor. The Monitors were powerful to say the least. When the water reached the Monitor it was compressed into a nozzle that was anywhere from one inch to eight inches in diameter. The stream of water that could wash down whole hillsides was impressive to behold. 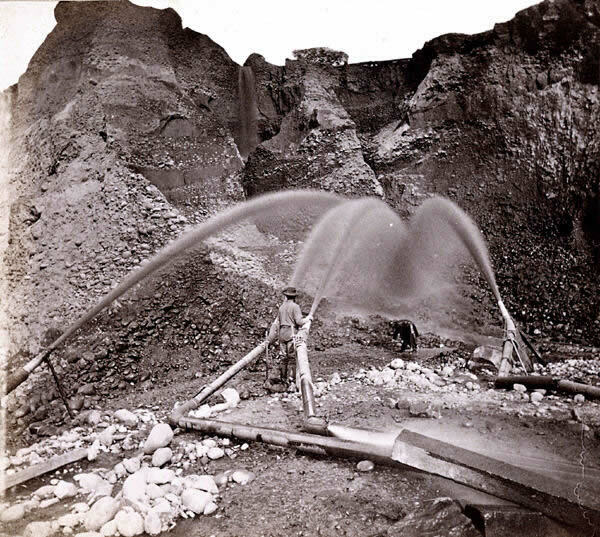 In his multi-volume 1874 - 1890 classic History of California, the historian Hubert Howe Bancroft stated that an eight-inch Monitor could throw 185,000 cubic feet of water in an hour with a velocity of 150 feet per second. Other accounts of the force are less technical but just as startling. One description points out that a strong man could not swing a crowbar through a six-inch Monitor stream, yet another commented on the striking phenomenon of a fifty-pound boulder riding the crest of a jet with the power of a cannonball. 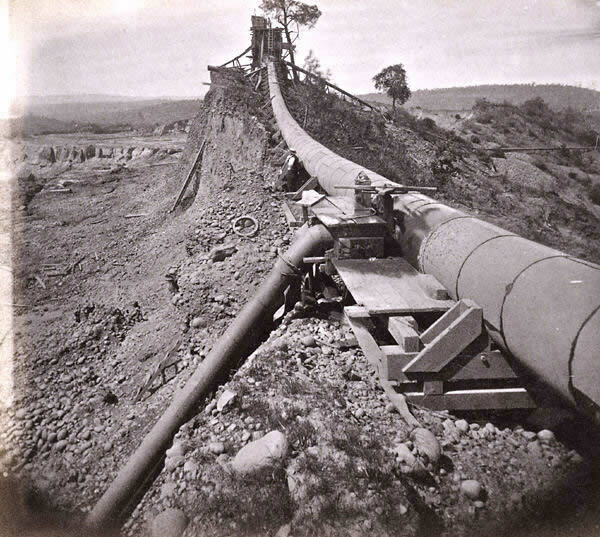 Documented evidence recalls that men were killed by the force of the water from 200 feet away. … sixty million gallons of water was used daily. The debris created was equally enormous. 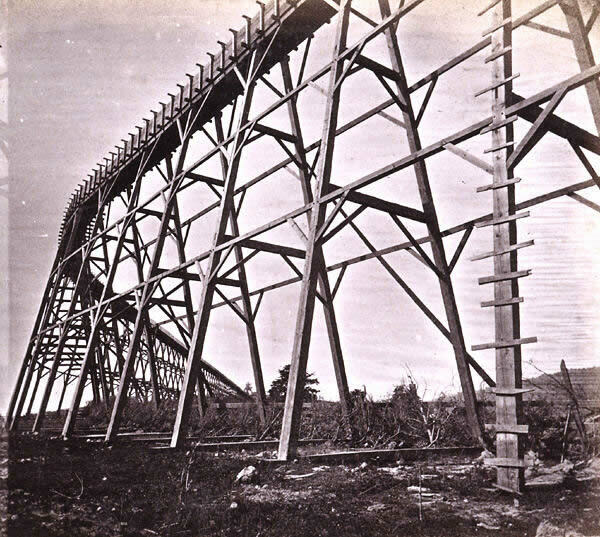 North Bloomfield, a mine about 1 1/8 mile long and 350 - 550 feet deep excavated 41 million cubic yards of material between 1866 and 1884. 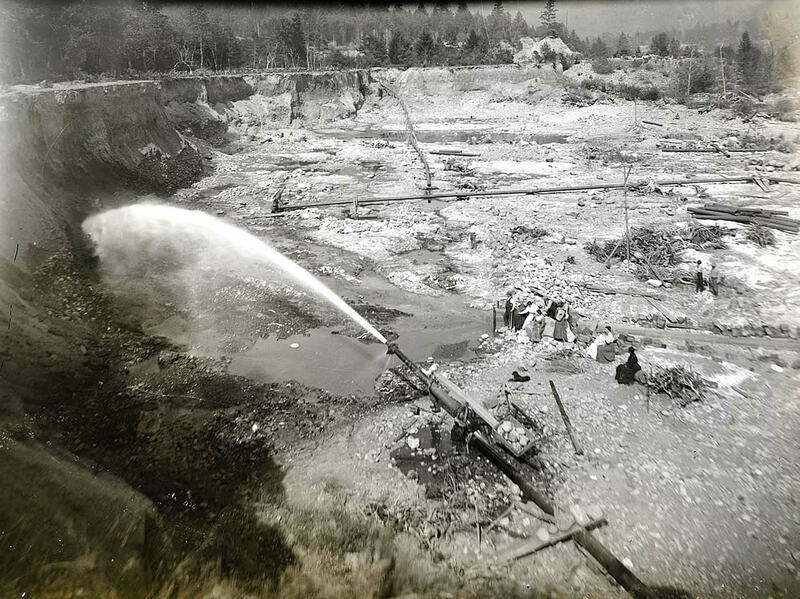 In 1891, a group of government engineers estimated that hydraulic mining had deposited 210,746,100 cubic yards of debris along the basins of three rivers alone -- the Yuba, American, and Bear. Tornado, flood, earthquake and volcano combined could hardly make greater havoc, spread wider ruin and wreck, than are to be seen everywhere in the track of the larger gold-washing operations. None of the interior streams of California, though naturally pure as crystal, escape the change to a thick yellow mud from this cause, early in their progress from the hills. The Sacramento River is worse than the Missouri. 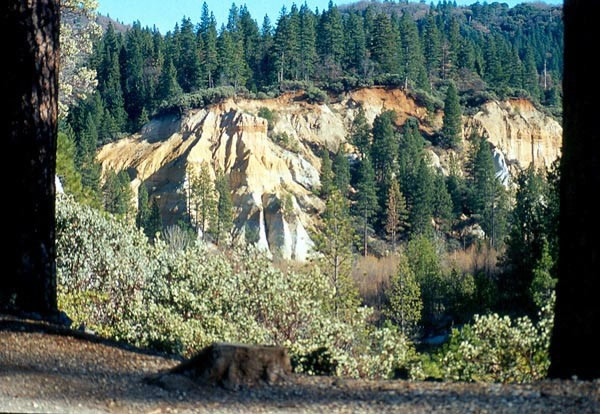 Many of the streams are turned out of their original channels, either directly for mining purposes, or in consequence of the great masses of soil and gravel that come down from the gold-washing above. Thousands of acres of fine land along their banks are ruined forever by the deposits of this character. A farmer may have his whole estate turned into a barren waste by a flood of sand and gravel from some hydraulic mining up stream; more, if a fine orchard or garden stands in the way of the working of a rich gulch or bank, orchard or garden must go. Then the tornout, dug- out, washed to pieces and then washed over side- hills, masses that have been or are being subjected to the hydraulics of the miners, are the very devil's chaos indeed. The country is full of them among the mining districts of the Sierra Nevada, and they are truly a terrible blot upon the face of Nature. 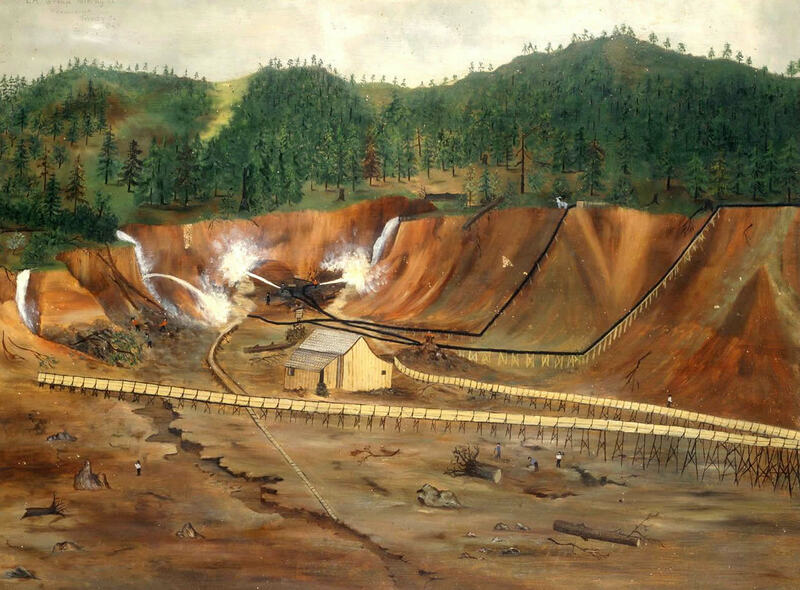 A painting of LaGrange Mine in Weaverville, Trinity County (date and artist unknown) Monitors washed away entire hillsides with incredible force Monitors operated 24 hours a day. 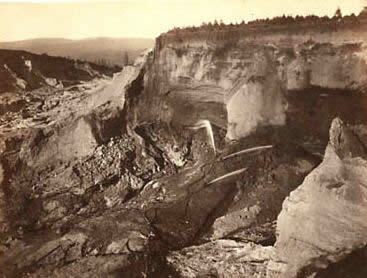 This is in Malakoff Diggins in 1870. 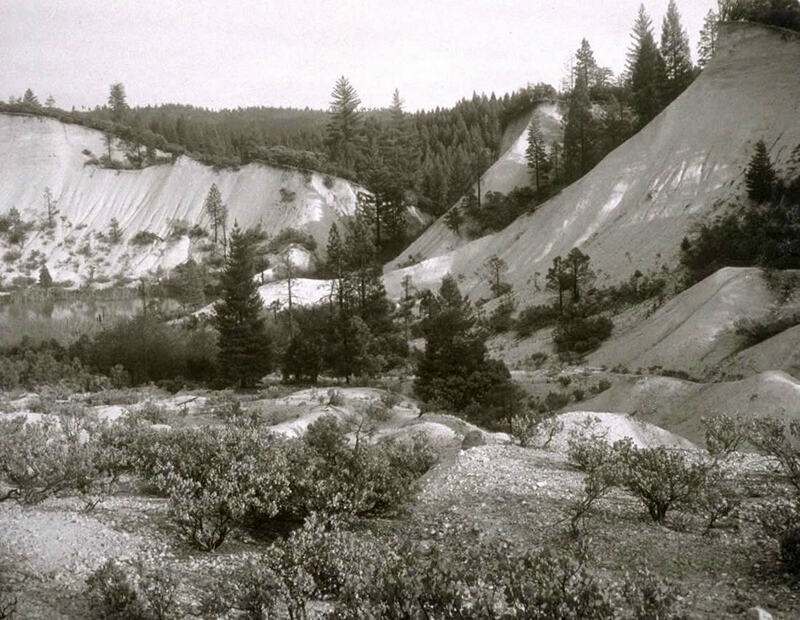 The remains of Malakoff Diggins in 1954. Photograph by Alma Lavenson. Malakoff Diggins today An advertisement for a hydraulic water cannon from the 1870s. Most water cannons were called “Monitors,” which was actually a brand name. 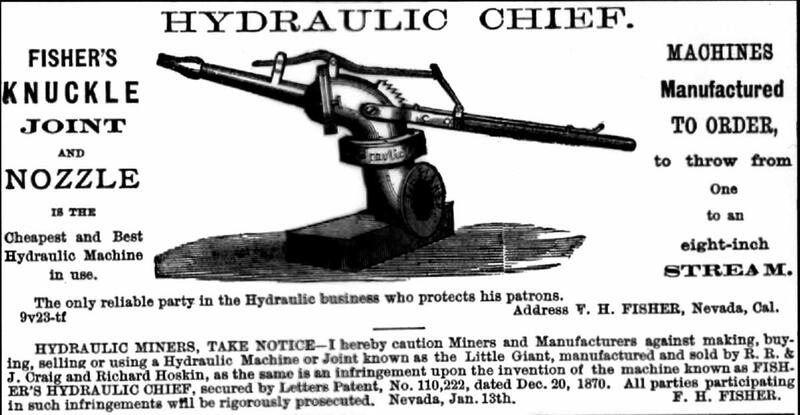 This ad is for the “Hydraulic Chief,” the brand name of the water cannon produced by the Fisher Company of Nevada City. Images from The Stanford University Library Department of Special Collections; The Eastman Collection of the University of California, Davis, Library; The Lawrence and Houseworth Collection of the Society of California Pioneers; the Collections of the Bancroft Library, University of California, Berkeley; the Humboldt State University Library; and SNVM staff.